20" x 60", 20" x 80", 20" x 120"
Follow Rest, 18" Face plate, 7 1/2" Steady rest with rollers, 12" 3-Jaw Chuck, 16" 4-Jaw Chuck, 10" Drive plate, Coolant system, Removable gap, 4-Way tool post, Thread chasing dial, 4-Position automatic Kick-Out Longitudinal carriage stop, Full length foot brake, Full length splash guard, Halogen work light, Dead centers ( 2 ) , Reducing sleeve - MT# 7 - MT # 5, Tool kit with tools, Operation & parts manual . 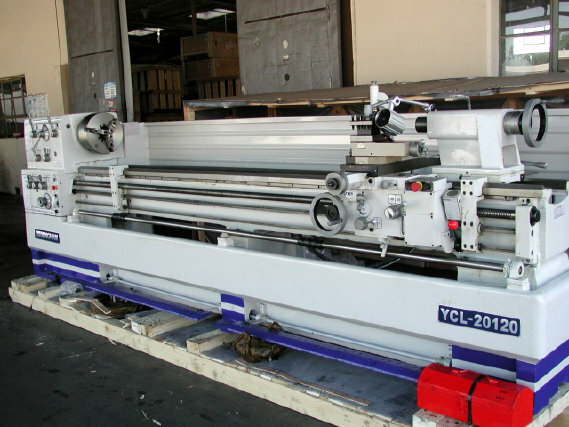 These 20" Swing BIRMINGHAM YCL Series Lathes include the models YCL-2060, YCL-2080 and YCL-20120. These Birmingham Lathes have proven themselves to be the choice geared head metal cutting lathe of the professional machinist . 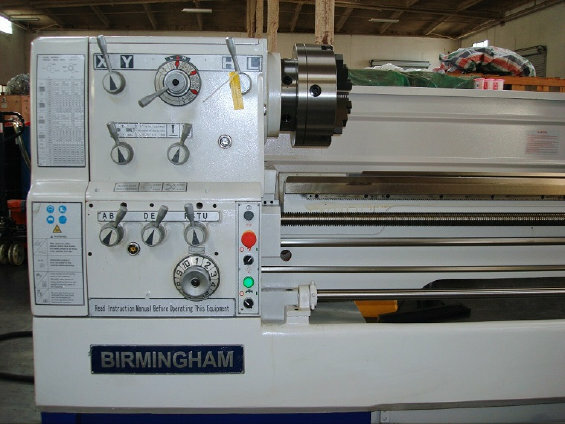 Some of the many features included on these Birmingham YCL Series Lathes are a one piece cast Iron base, Removable Gap Bed, 10 HP main motor, 3 1/8" Spindle Bore, 60 kinds of inch threads, 47 kinds of metric threads, 39 kinds of module threads and 50 kinds of diametral pitch threads. No change gears are required for most thread cutting applications. The Birmingham YCL-2060, YCL-2080 and YCL-20120 Lathes feature a fine grain high tensile strength bed and will provide many years of trouble free service . All gears, shafts and bedways are hardened & ground and the main spindle is hardened & ground. 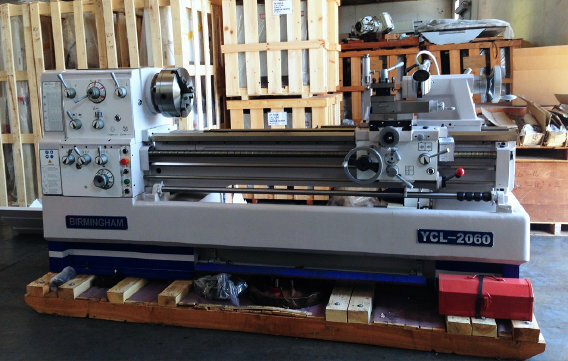 Additional features and equipment on the Birmingham YCL-2060, YCL-2080, YCL-20120 Lathes include 3 and 4-Jaw Chucks, face plate, steady rest, follow rest, 4-Way Tool Post, thread chasing dial, dead centers, reducing sleeve, full length splash guard, one piece cast iron base, foot brake, worklight, coolant system, leveling pads, 4 position auto kick-out longitudinal carriage stop and tool box - and for a limited time we are including a free taper attachment - installed - at no extra cost.